M&A activity has recovered since the 2009-10 lows albeit not mirrored the Stock Market rebound with the Dow hitting and surpassing all-time highs. M&As as well as PE activity on the other side seem to be hovering around pre-crisis levels. During full year 2012 global M&As reached $2.2tr, barely posting any growth from 2013. North American deals reached $943 bn, a 5% increase over previous year. These figures stand at 2/3 of the 2006-7 total deal value. We have to go back to 2004 to note an increase of a mere 2.3% CAGR, which should be in line with GDP growth patterns. PE Overview: A new Paradigm or Trough? These lower levels of activity may be just the normal state of things, a new paradigm away from the mega-deals facilitated by excessive leverage in 2006-7. On the other hand PE and M&A cycles move in 5-7 years intervals with PE buyouts representing a sliver of total M&A activity, at around 10%, slightly increasing as a percentage during the last decade. Taking this into consideration we may just be waiting for the next big story that will spark a boom. Furthermore as textbook financial planning has it, a proportion of private assets should be allocated to alternative investments for diversification and excess return purposes. This may as well spark, at some point, PE growth. We will cover M&A trends, segmentation and valuations on another topic. In this we will focus on PE activity as well as ways to increase value and returns by operational means, more so since financial engineering and exits are not that easy. 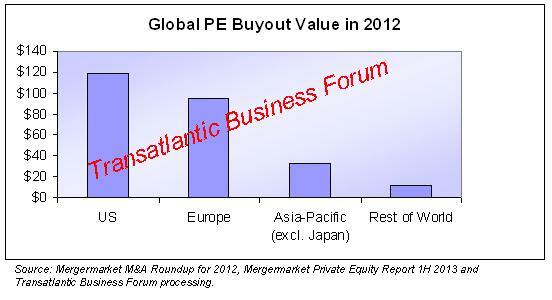 PE buyouts reached $259bn in 2012 with US representing almost half of that at $118bn, up from $112bn in 2011. Outside US, around 35% of PE buyouts took part in Europe, 11% in Asia excluding Japan, with the balance spread around the world. Although fiscal problems, Europe has been a source of dealflow due to integration, cross-border deals, bottom fishing and privatizations. Average deal size is around $100mn in Europe but 50% higher in the US. PE activity has grown at 25% post 2009 lows for Europe and Asia but in US, where PEs are more prominent, growth was double that at 50%, according to Bain. In the first half of 2013 global PE buyouts reached $144bn (according to Mergermarket) up by 17% from the respective period in 2012. Sectors of interest for PE investment at least in the US are consumer (B2C businesses), computers/IT, followed by pharmaceuticals and health. Energy is also attractive both in resources and equipment. Biggest PE deals in 2012-13 were: Heinz ($27b by Berkshire Hathaway and 3G Capital Partners), Dell ($20b by Silver Lake partners and Michael Dell), BMC Software ($6b). The Dell deal also underlines the increasing interest for public to private transactions. Exits: Can I cash my chips please? Investments don’t worth much more than what you get paid for. Much of the PE activity currently is not in buyouts but working through exiting the backlog of prior investments. 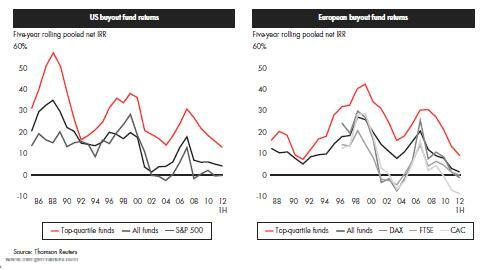 As a result holding periods have increased to 6 in 2013 compared to around 3 in 2007 according to Pitchbook. Secondary investments have been gaining attention over IPOs due to difficult conditions there. According to Bain, sponsor-to-sponsor deals tend to historically fair better than other deal types. 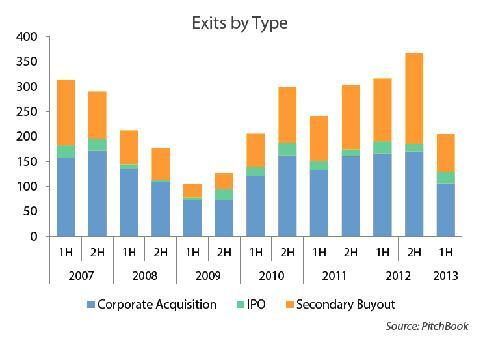 Almost half of exits in 2012 were realized through secondary buyouts vs. 25-30% five years ago. Other more unique methods such as dividend recaps are gaining traction, especially in uploading large investment. KKR and Bain for example geared up HCA prior to refloating, to take some money out of the table. Middle Market: Ample opportunity but where’s the value? PE activity has been affected by the absence of leverage and the eclipse of the 2006-2007 mega-deals (such as Energy Future Holdings (TXU) for $44b, HCA for $32.7b, Equity Office Properties for $39b, first Data $29b, Harrah’s $27b, Alltel $27b, Hilton $26b to name the biggest). In this environment middle market deals (between $250-$1bn ) are fairing much better. It’s easier to maneuver such investments, turnaround and even exit as we have discussed in this blog before (see Middle market cross-border M&As set to grow, Large Private Equity Deals-that 800 pound gorilla). For example the largest ever LBO of TXU has not turned out very well with the company heading to bankruptcy and the PEs that led it, even prominent, such as Goldman Sachs Capital Partners, KKR and TPG Capital, standing to almost write-off their investment (Business Week, Buyout firms clash over energy biggest ever LBO). Middle market investments also offer benefits when planning exits through aggregating/consolidating companies into larger units and ripping benefits of scale and better valuations. It’s what we’d call “riding up the multiples curve”, ie pretty much scaling up a business by adding activity around a tested operating model and get higher valuations with size. A small company might have good products but what makes or brakes a company is the structure, that’s the reason so many wonderful ideas fail. Access to distribution channels, capital and talent is easier for larger companies. There are an estimated 300,000 middle size companies in the US of which PEs own around 35,000 (The New Math of Middle Market M&A, Robert Slee The Value Examiner, July/August 2009). According to Robert Slee, who is probably one of the very few if not the only finance theorist in the context of small/private businesses, 75% of middle size companies destroy value as they usually produce returns below their cost of capital. Cost of capital for small/private businesses according to his calculations is in the high 20s. That is after taking into consideration risk, cost of financing and bypassing CAPM theory that arguably is more suitable for capital markets. These low return patterns can be more accentuated by the fact that much of the owner’s investment is not recorded, such as unpaid/underpaid management time as well as other resources. Although the ample availability of opportunities, it’s not easy to score a home run in the sector. Companies are often the extension of their owners’ lifestyles and not purely an investment. Owners are not willing or not equipped to realize value for their businesses. In these cases it’s simply better to pass. As Graham put it ‘Price is what you pay; Value is what you get’ and in these cases the two diverge significantly. Slee estimates top performers in middle market an additional 9,000 over the ones already owned by PEs. So numbers are not that good, hence PEs prefer to go international where there’s higher demand for capital. 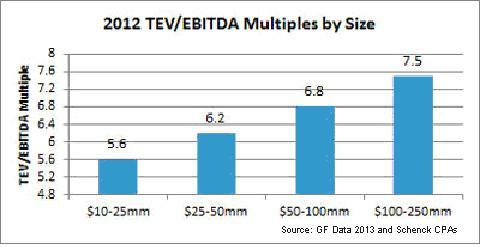 Valuation Multiples: Buying low and selling high, at some point..
Current M&A multiples are below those of the last crisis, although edging higher. PE buyout multiples are usually lower than those for strategic acquisitions but during the crisis spiked over them; another sign of those times. Currently, MA multiples are at the 8 range, having reached low teens, around 12, in 2007 according to American Appraisal. Financing multiples are currently at the 7-8 range with average exit multiples at 11 according to Mergermarket. This is rather low if compared to multiples of low 20s during 2006-2007. Median exit multiples are even lower, close to 8 times, according to Pitchbook. Considering the backlog of rich investments from previous years and challenging exit multiples this is not the best situation. All these indicate a much narrower space for realizing returns which stress the importance of operational gains. PE investing is not a straightforward success. Currently one year PE IRR is at 5%, much fueled by mark to market valuations, the change brought about with IFRS and SFAS fair value accounting rules. The five year IRR is at 10% having fallen from almost 30% in 2006-7 and much higher in the 40s, at end of 90s, according to Bain. Hence the academic discussion now centers around the PEs’ elusive alpha. So how do PEs create value? We can’t go over the secret sauce in detail here but in general PEs work with performance indicators that are tied to financial performance, which is how they measure their own performance after all. For example ROE based models focus on increasing factors such as Asset Utilization, Profitability and Leverage which pretty much center around sales strategy, cost of capital, cash flow management, cost cutting and getting rid of underperforming assets and units. Asset stripping is a well documented strategy that frees up capital and unrealized value. Pricing is another important value creator. Bain estimates that 1% rise in price results in 15% boost in pretax profits while an increase in sales volume only has half the effect (due to variable costs incurred). This can be achieved with specially targeted sales and marketing strategies. An example of a recent turnaround story is Kodak. The once blue-chip giant has filed bankruptcy two years ago as its core business gradually failed. The company had been criticized for denying industry changes and remaining attached to its once dominant film business, passing over the digital revolution. After emerging from a private equity backed restructuring plan it just recently returned to the stock market. Under the restructuring plan Kodak sold its film business to its UK pension fund, as well as various patents and inevitably downsized. It now focuses on high-end market segments of packaging, graphic communications and digital imprinting. Turnarounds though are not easy. Many investments fail, same as for TXU, even if some of the best PEs are involved. According to a survey of M&A practitioners, carried out by Deloitte and Mergermarket in 2012, factors critical for successful M&As, were communicating effectively, quickly establishing goals (usually this is under a 100 day plan), having a post acquisition plan in place before closing and selecting key people. Value creation starts however with information. This is the foundation and more; without it doing business is like sailing without a compass. Information is important both at the pre-acquisition phase during due diligence, as well as after that through value buildup. An accurate due diligence that will reveal the target’s true operational and financial position as well as a well-planned post integration plan are of paramount importance. Especially with smaller companies due diligence may be more challenging as information may not be there. According to the Deloitte survey, almost half of buyers would spend more time on due diligence. That’s where PE consultants are particularly useful as they bring to the table specialized knowledge and readily deployable bandwidth. Pursuing an M&A is nothing to be taken lightheartedly; it’s a specialized, stressful task that requires detailed planning and execution. Don’t take us wrong, it’s possible that buyers can carry this on their own, but trying to reinvent the wheel while keeping eyes on running own business might turn out particularly costly (ie, don’t text and drive). So when in this situation do yourself a favor and turn to external M&A experts. Collecting the information is one thing and acting upon it in a timely manner is another. In many cases companies are not ready to operate under PE professionals’ standards that often have blue chip corporate or consulting background; hence high expectations in terms of strategic planning. Urgency and efficiency in implementation is important, otherwise problems tend to linger and front loaded value/cash flows wasted. According to a SolomonEdwards survey, part of the grievance and inefficiencies result from poor communication between target CFOs and PEs. We could add here that communication can’t work if the two speak difference languages. What we mean by that: traditional CFO roles in small-middle companies fall more within the controller/bookkeeper domain. Their primary focus is keeping eye on expenses and cash levels. Planning is not a known quantity. Little is done in collecting information for strategic decision making. CEOs/owners pretty much flow with past norms or gut feeling. Getting to perform at strategic level and communicate with the finance/MBA types of PEs is just about similar to learning another language; a change one may not be prepared for, let alone able to make. Increasing financial literacy or management training is useful. Just clocking in and out may not be enough anymore; consciousness of value factors throughout the organization and even equity in them might help (ie management by objectives models). However that is not always easy if people have not been used to. That’s where PE consultants are again useful. They are called to support these CFOs both at the pre-acquisition/due diligence phase as well as after that in streamlining operations and coordinating communications. Companies like Accordion or Solomon Edwards are building successful business models around that by providing specific resources, bandwidth and knowledge. Accordion has also established a specific service for facilitating information collection and dissemination. Operational partners are also used in improving performance. PEs also usually work with tested interim managers who have industry specific experience and are posted to targets to perform specific functions. We want to point out here to Peer-to-Peer networks that can also support executives. These are however more useful for independent companies that want to up their game as there can be a duplication with the PEs. Midas Managers or Michael Milken-backed Vistage are such networks. Midas Mentors take a cut of returns they create while in Vistage there’s a cost for participating in meetings. Other formal or informal groups, associations and NGOs exist for the same reason. After all there’s good supply of resources as the recession changes has created a slew of experienced middle managers and executives to tap into. However without being able to control implementation, results can be dubious. Moreover is also difficult to find listening ears that are appreciative of intellectual contributions and able to afford them before it’s too late or for owners to connect with experience that is right in the money. Finally turnarounds come down to people. On the outside management theories make sense to all but the real challenge is implementation. Many can spot shortcomings in an underperforming company; what’s differentiates the makers is the effectiveness in pursuing and implementing changes. Humans mostly resend change, let alone if those changes challenge a favorable status quo. New PE owners may be in a better position to change things due to the power they are versed with, but this is not always adequate. In fact it can as well backfire. Most of the times however the main problem is, as one of practitioners bluntly put it, “what’s behind the manager’s desk”. According to the Deloitte research, around 2/3 of acquirers state that key personnel is one of the main success factors in M&As. It’s one thing not to be able to do, or don’t want to do something and another ignore its existence (and contrary to Socrates, still believing that you know everything). In these cases it’s fair to make a decision and move on with a management change. A high percentage of executives, especially CFOs are eventually replaced when PEs step in. The CFO role has become indeed quite challenging and tenures have shrunk significantly over the last decades. In closing, let’s discuss PE trends going forward. As already mentioned this is not a great environment, at least as practitioners would like, however the picture is not that bleak. One good thing is that there’s a lot of capital available for investing. Bain estimates that the PEs’ dry powder can last for up to 3 more years. Main focus of activity will be North America along with middle market and emerging markets. Fundraising is pretty satisfactory as fund managers are seeking diversification, rebalance their appreciated portfolios as well as the elusive alpha. However capital doesn’t come easy. What’s important in selecting GP teams is consistency of performance as well as having “skin in the game”. After all everybody makes mistakes, it’s how many vs. successes that differentiate the leaders. Stock markets are also getting stronger to facilitate exits. On the reverse route public to private deals, such as Dell’s, are gaining attention and may contribute to the sector’s comeback as did in 2007 (ie the HCA deal). After all however buyouts are justified when the underlying business is healthy, valuation is correct and there’re promising exit prospects. As Warrant Buffet put it: “It’s far better to buy a wonderful company at a fair price than a fair company at a wonderful price”.